“Reverse logistics” – what exactly is that? Many readers don’t understand what it means or its implications for businesses. And you’re not alone – many attempts have been made to define reverse logistics, but the explanation often makes the concept even harder to understand. Logistics is defined by The Council of Logistics Management as: The process of planning, implementing, and controlling the efficient, cost effective flow of raw materials, in-process inventory, finished goods and related information from the point of origin to the point of consumption for the purpose of conforming to customer requirements. Whew! That was a mouthful. 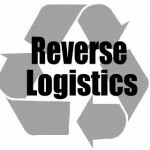 Reverse logistics essentially encompasses all of the aforementioned activities as they operate in reverse. We’ll try to explain reverse logistics in the most universally relatable way possible. The ultimate goal of reverse logistics is to capture value by making the flow and storage of goods from their point of consumption to their point of origin more efficient and cost-effective. This can mean reusing containers, recycling packaging materials and even redesigning packaging to use less material. Considering that we’re discussing reverse logistics, only those activities that involve sending goods or materials “backward” apply. This can include restocking, seasonal inventory, recalls, processing returned, damaged merchandise, excess inventory and more. It can also include recycling programs, asset recovery, obsolete equipment disposition and hazardous material programs. As you have likely inferred, reverse logistics helps to lessen the impact that the flow and storage of goods has on the environment. While traditional logistics is focused primarily on making these processes more efficient from start to finish, reverse logistics inherently emphasizes a focus on sustainability. We will discuss this aspect of reverse logistics in the coming weeks.